Why are you paying your cleaning company for water? Did you know that most of the cleaning products on the market are 90-95% WATER? It’s true! No matter where your cleaning needs are: home, office, school, warehouse, shopping center, hospital, nursing home or boat, if you have a water supply, it surely makes good common sense, not to mention financial and environmental sense, just to add water on site. Here’s a better idea; use a portion controlled solution chemical solution! 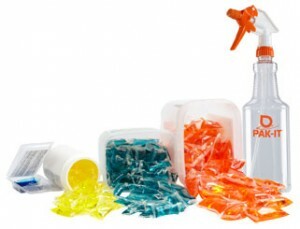 PAK-IT® has taken the concept of the dissolving pod which everyone knows for laundry and dish washing and applied it to over 30 janitorial, housekeeping, break room and facilities maintenance cleaning products. PAK-IT® technology combines the best of pod technology in one offering which is the reason why industry leaders such as Proctor & Gamble, Reckitt Benckiser and Staples have all either licensed or private labelled PAK-IT® technology. PAK-IT® IS Concentrated without the complex dilution ratios, mess, spills and waste of traditional bulk free-poured concentrates commonly referred to as the Glug Glug Glug method. PAK-IT® is Portion Control without: the headaches and maintenance, capital commitments, long term service contracts, training, specialty plumbing and manual calibration and metering of wall-mounted dilution control systems. PAK-IT® is Single-Serve technology without the need to cut, tear or open the packets. Don’t take our word for it, click on the Vimeo link or image below to learn how to use and key information on PAK-IT® brand cleaner. http://vimeo.com/103444018.